Lake Geneva Games has a lot of release weekend Magic the Gathering events this Friday, Saturday, and Sunday starting with . . . The first weekend we can use Eldritch Moon booster packs for our FNM Booster Draft. This start at 6 pm so try to get there a bit early to be sure you don't miss out! We'll follow that up Saturday and Sunday with 1 pm $15 Booster Drafts (3 booster packs, 3 rounds, +1 pack per round won plus Promos!). Come in both days and play in these inexpensive drafts to build up your selection of Eldritch Moon cards and get used to the new set. But the BIG event is Saturday evening starting at 6 pm. It's a $20 Booster Draft for a Box! 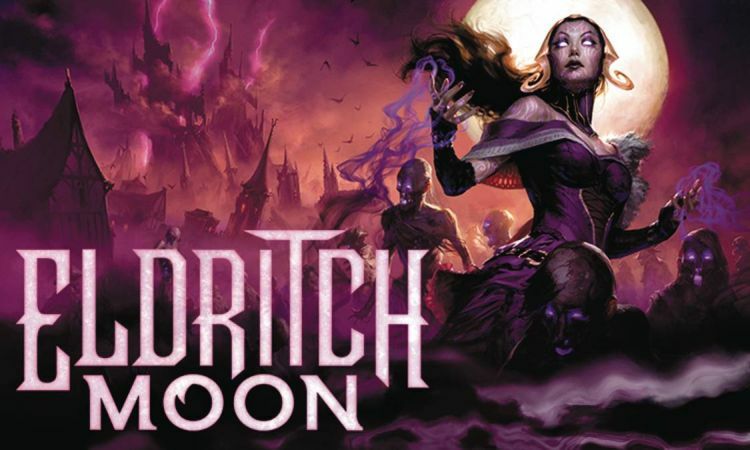 It's an Eldritch Moon $20 Booster Draft (3 booster packs, 3 rounds, Minimum 8 players) and the winner gets a Sealed box of Eldritch Moon and all players get a promo! Finally, on Sunday at 5:30 pm, we have the first week of our six-week Magic the Gathering League. Each Sunday we play a Shadows Over Innistrad block constructed tournament, with the added deck building restriction of only 1 mythic. The tournament each Sunday is free to league members, and only league members may play in it. The cost to join the league is $10. Each player finishing each tournament gets +1 pack, and there is a +1 pack per 4 players prize pool awarded to the first place player, or shared by those tied for first. Each tournament is 3 rounds Swiss pairings. Block Constructed is similar to Standard, except more restrictive. Only cards from Shadows Over Innistrad and Eldritch Moon sets are legal in your 60 card deck and 15 card sideboard. Further, there is a restriction of ONE mythic rare card in your library at the start of each game. You may have more mythics in your sideboard, but only one mythic can be in your library at the start of each game.